Escape the hustle and bustle of Osaka, and head to the Okayama district. During this day trip, you’ll spend time at Sayo Nanko Sunflower Park, enjoy a local lunch, visit a fruit farm in the area, and stroll the streets of Kurashiki Bikan Historical Quarter. Plus, this day trip from Osaka includes comfortable round-trip transport for a stress-free experience. Your day trip begins with pickup when you’ll board an air-conditioned vehicle destined for the small town of Sayo in the Hyogo Prefecture. 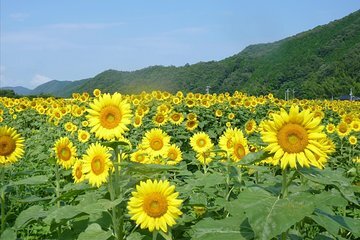 On arrival at Sayo Nanko Sunflower Park, you’ll embark on a walk through the fields, all of which burst with the vivid yellow blooms of sunflowers. Capture photographs of the flowers, whose beauty is enhanced by a backdrop of mountains and blue skies, before you continue to Okayama for lunch. Lunch in Okayama is included with your tour price, and is at a local restaurant. Enjoy pork and seafood dishes alongside fruit. After feasting on lunch, you’ll head to a nearby fruit farm for a white peach picking session, during which you'll take photos and be able to pick one peach to take home with you. Your final stop before drop-off in Osaka is in the Kurashiki Bikan Historical Quarter, where you'll walk along the Kurashiki River waterfront. Infant (0-2 years old) are free of charge with no arrangement. Child (3-5 years old) rate includes bus seat and all-you-can-eat 3 kinds of fruits only. The best time to view sunflowers in bloom varies depending on the weather and temperature of the season. The tour schedule is based on the condition of the flowers in the past years. However, in some cases you might not able to enjoy the scenery as shown in the photo. Please note there will be no refund regardless of the conditions of the flowers. At Kurashiki during the free time some attractions will be closed depending on the day. ※Please pay the entrance fees by yourself.